Let's take a quick look at your basic knowledge of physics. Combustion is a chemical reaction in which a fuel (in our case wood or pellets) is burned by a comburent (oxygen), which leads to heat being released. What does this mean? It means that the supply of oxygen through an air vent is fundamental in ensuring that combustion occurs properly. 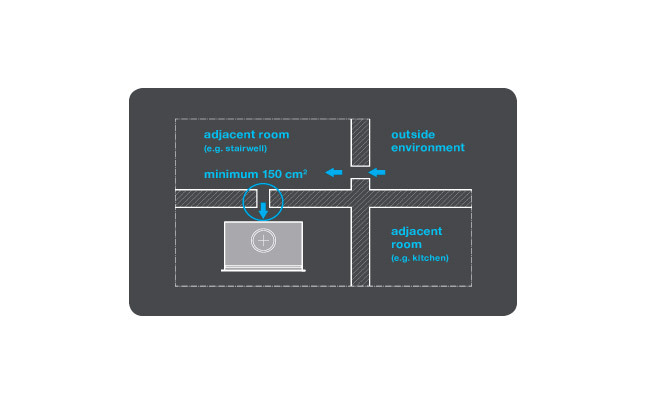 An air vent is not used just to supply oxygen, but also to keep the pressure in the room at such a level that it ensures a perfect flow of air. The smoke generated by combustion must go up the flue and not back in the room. This is helped thanks to the flow of fresh air coming in, which prevents a so-called “depression”. How can we provide this inlet without making it too big? Here are the most practical solutions. 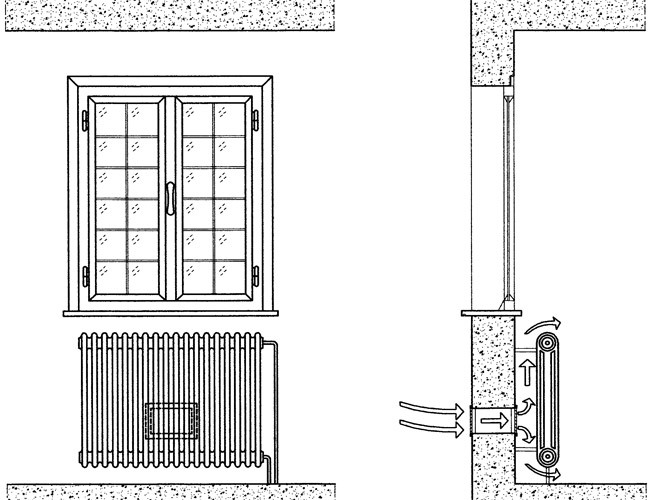 If the stove is mounted on a perimeter wall, the hole (with a minimum free cross-section of 150 cm2 with either a rectangular or circular shape) must be made as close as possible to the stove to prevent annoying draughts of air that might occur in the room. It is not necessary that the hole is situated on the same wall of the stove. An interesting solution may be to "hide" the hole behind the radiator grille, as in the image here below. For fireplaces, the best solution is to create the air inlet inside the cladding itself. If the fireplace or stove is not installed directly on the perimeter wall, outdoor air is drawn in directly from a floor ducting. This system can be adopted but you must bear in mind that a maximum distance of 3 metres must not be exceeded. What's more, in this case, you need a bigger inlet (a minimum section of about 165 cm2). 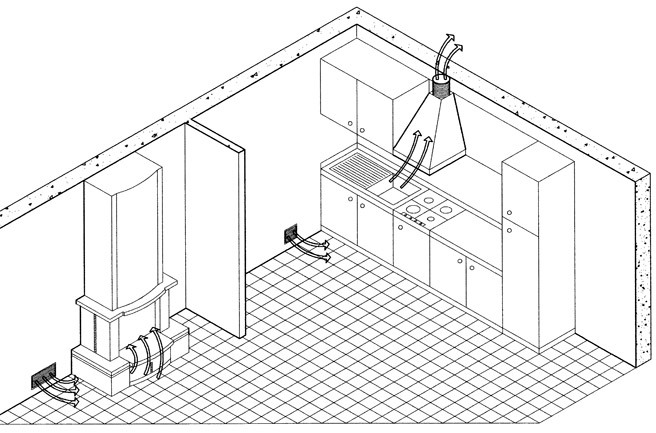 The supply of air required for the combustion can come directly from outside the house or even from adjacent rooms – as long as they have an external air inlet and are not used as a bedroom, toilet or a room where a fire hazard exists (garage, woodshed, storage room with flammable material). In rooms used as a kitchen and living room, make sure that the hoods have an air intake. Additionally, when both the fireplace and hob or gas oven are on, this might create a depression. It is always better, therefore, to provide each one with its own external air compensation inlet. 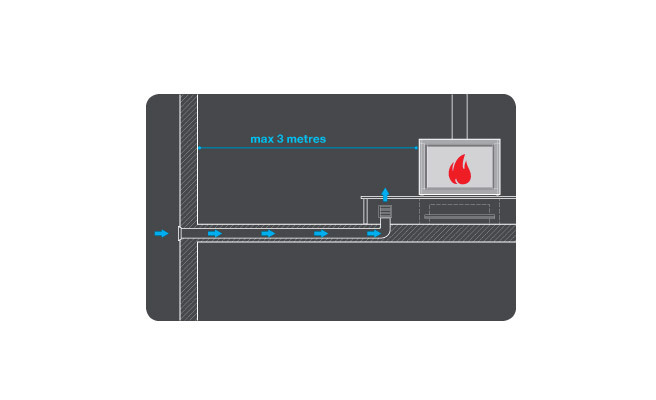 Do you want to know more about the rules for the installation of a fireplace? Discover the "Guide to the design of the fireplace," created by the technical consulting service MCZ. You'll find it here on Issuu (in Italian), but it will soon be available in English also.